In just over two weeks Britons will vote on whether to stay in the European Union. 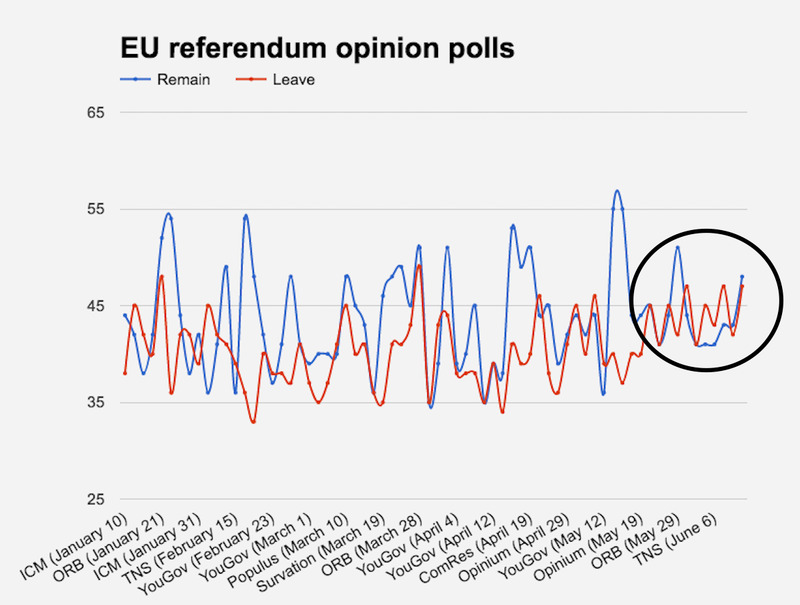 Worryingly for Remain, a major problem that dates back to the very first referendum opinion polls still hasn’t been addressed: Not enough people who want Britain to stay in the EU are certain to vote on June 23. An ORB survey published in March showed that 72% of respondents who planned to vote Remain were certain to vote. This compared to 79% of Brexit-supporters who said the same. Three months later, this trend is still visible and appears to be getting more severe. ORB’s latest phone poll results that were published yesterday indicated a one-point lead for Remain (48/47). However, 69% of Leave supporters told ORB that they are certain to vote on June 23. Just 54% of Remain supporters said the same. In a referendum of such fine margins, such a gulf in voter motivation could be absolutely crucial. It could determine the outcome. 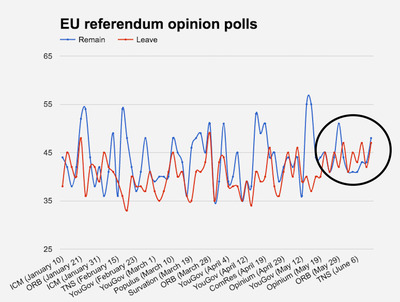 Business Insider’s live chart below shows how close the referendum race is after support for Brexit increased over recent weeks. When you include all of the respondents of ORB’s latest poll — not just those who will definitely vote but those who might do, too — Remain has a 12-point lead. This shows the Remain campaign needs to quickly find a way to motivate pro-EU supporters. There are two popular theories as to why Remain supporters are not more fired up about taking part in this referendum. Firstly, the overwhelming majority of Remain supporters think that Britain will vote to stay in the 28-nation bloc. Populus data released last week revealed that 85% of Remain supporters expect to be on the winning side. It is possible that confidence among Remain has created widespread complacency — voters think that if they sit the referendum out it won’t have an affect on the outcome. 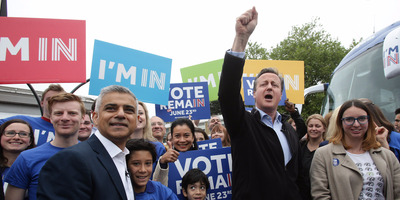 Yui Mok / PA Wire /Press Association ImagesPrime Minister Davis Cameron and London mayor Sadiq Khan join forces to rally Remain support. Then there’s the issue of the stay-at-home youth. An Opinium poll published in April was one of many surveys that confirmed the widely-held belief that young people are more likely to back Remain. However, the same poll showed that just 52% of young people (18- to 34-year-olds) were certain to get out to vote on June 23. Recent efforts to encourage the British youth to register to vote have had some success. The Electoral Commission received around 150,000 registration applications from people aged below 25 on Monday, and on Friday, a Facebook alert led to 100,000 young people registering in just a single day. As things stand, public opinion is moving in support of a Brexit. If Remain supporters don’t want to wake up on June 24 as non-EU citizens, then they must acknowledge the reality that there’s no room for complacency.